Though UIP published photography on the beauty of the Midwest and the University of Illinois campus, we also venture out of these expected subjected areas. This week we present a few books that venture into landscapes of industry and humanity as seen through the shutters of three extraordinary photographers. So often we imagine the Midwest solely as a place carpeted in useful, productive land, a “breadbasket” ideally suited to raising crops and livestock. There is another Midwest, however, one marked by lands that historically have resisted human purpose: the dark swamp forests of the far north, Nebraska’s arid Sand Hills, the rockbound Flint Hills of Kansas. Such lands as these, although difficult to cultivate, are valuable in terms not calculable in units produced or metric tons shipped. Many have been preserved as national parks or wildlife refuges. All hold secrets for the careful observer. Gary Irving shares photos that uncover the mystery and beauty of a part of the country that, for most people, exists hidden in plain view. 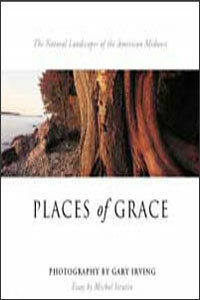 Places of Grace reveals both the physical splendor and the natural history of a ten-state region encompassing Illinois, Nebraska, Wisconsin, Minnesota, Iowa, Missouri, Kansas, Ohio, Indiana, and Michigan. Impressive in its strength, the Calumet Region in northwest Indiana also moves us with the poignancy of its struggle. 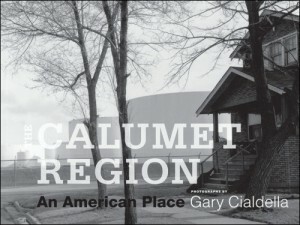 Gary Cialdella presents a series of black and white images of this legendary industrial/residential landscape. A professional architectural photographer, established fine artist, educator, and historian, Cialdella found himself drawn to the region of his youth for a photographic exploration that has lasted more than twenty years. Nearly one hundred of those images appear in this book, reflecting the artist’s sensitive, sustained vision and the changes the region has experienced through economic shifts and the irresistible rhythms of time. Steel mills, tank farms, and refineries coexist with neighborhood houses in the artist’s beautifully composed pieces, which please the eye with their full tonal range and crisp focus. Cialdella himself provides descriptions and explanations of his working methods, sources of inspiration, and life experiences to add even greater richness to his images. Essays by Gregg Hertzlieb and John Ruff reflect on Cialdella’s work as a definitive photographic treatment of the region’s landscape. The paintings, murals, and graphics of Ben Shahn (1898–1969) have made him one of the most heralded American artists of the twentieth century. But during the 1930s he was also among the nation’s premier photographers. Much of his photographic work was sponsored by the New Deal’s Farm Security Administration, where his colleagues included Dorothea Lange and Walker Evans. 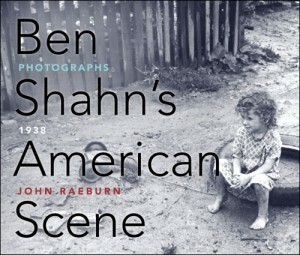 Ben Shahn’s American Scene: Photographs, 1938 presents one hundred superb photographs from his most ambitious FSA project, a survey of small-town life in the Depression. John Raeburn illuminates the thematic and formal significance of individual photographs and reveals how, taken together, they address key cultural and political issues of the years leading up to World War II. Shahn’s photographs highlight conflicts between traditional values and the newer ones introduced by modernity as represented by the movies, chain stores, and the tantalizing allure of consumer goods, and they are particularly rich in observation about the changes brought about by Americans’ universal reliance on the automobile. They also explore the small town’s standing as the nation’s symbol of democratic community and expose the discriminatory social and racial practices that subverted this ideal in 1930s America.